Hugo Grotius, in his native country Huig van Groot, but known to the rest of Europe by the latinized form of the name, Dutch publicist and statesman, was born at Delft on Easter day, the 10th of April 1583. The Groots were a branch of a family of distinction, which had been noble in France, but had removed to the Low Countries more than a century before. Their French name was de Cornets, and this cadet branch had taken the name of Groot on the marriage of Hugo's great-grandfather with a Dutch heiress. The father of Hugo was a lawyer in considerable practice, who had four times served the office of burgomaster of Leiden, and was one of the three curators of the university of that place. In the annals of precocious genius there is no greater prodigy on record than Hugo Grotius, who was able to make good Latin verses at nine, was ripe for the university at twelve, and at fifteen edited the encyclopaedic work of Martianus Capella. At Leiden he was much noticed by J. J. Scaliger, whose habit it was to engage his young friends in the editing of some classical text. At fifteen Grotius accompanied Count Justin of Nassau, and the grand pensionary J. van Olden Barneveldt on their special embassy to the court of France. After a year spent in acquiring the language and making acquaintance with the leading men of France, Grotius returned home. He took the degree of doctor of law at Leiden, and entered on practice as an advocate. Notwithstanding his successes in his profession, his inclination was to literature. In 1600 he edited the remains of Aratus, with the versions of Cicero, Germanicus and Avienus. Of the Germanicus Scaliger says, "A better text than that which Grotius has given, it is impossible to give"; but it is probable that Scaliger had himself been the reviser. Grotius vied with the Latinists of his day in the composition of Latin verses. Some lines on the siege of Ostend spread his fame beyond the circle of the learned. He wrote three dramas in Latin: Christus patiens; Sophomphaneas, on the story of Joseph and his brethren; and Adamus exul, a production still remembered as having given hints to John Milton. The Sophomphaneas was translated into Dutch by Vondel, and into English by Francis Goldsmith (1652); the Christus patiens into English by George Sandys (1640). In 1603 the United Provinces, desiring to transmit to posterity some account of their struggle with Spain, determined to appoint a historiographer. The choice of the states fell upon Grotius, though he was but twenty years of age, and had not offered himself for the post. There was some talk at this time in Paris of calling Grotius to be librarian of the royal library. But it was a ruse of the Jesuit party, who wished to persuade the public that the opposition to the appointment of Isaac Casaubon did not proceed from theological motives, since they were ready to appoint a Protestant in the person of Grotius. His next preferment was that of advocate-general of the fisc for the provinces of Holland and Zeeland. This was followed by his marriage, in 1608, to Marie Reigersberg, a lady of family in Zeeland, a woman of great capacity and noble disposition. Grotius had already passed from occupation with the classics to studies more immediately connected with his profession. In the winter of 1604 he composed (but did not publish) a treatise entitled De jure praedae. The manuscript remained unknown until 1868, when it was brought to light, and printed at the Hague under the auspices of Professor Fruin. It shows that the principles and the plan of the celebrated De jure belli, which was not composed until 1625, more than twenty years after, had already been conceived by a youth of twenty-one. It has always been a question what it was that determined Grotius, when an exile in Paris in 1625, to that particular subject, and various explanations have been offered; among others a casual suggestion of Peiresc in a letter of early date. The discovery of the manuscript of the De jure praedae discloses the whole history of Grotius's ideas, and shows that from youth upwards he had steadily read and meditated in one direction, that, namely, of which the famous De jure belli was the mature product. In the De jure praedae of 1604 there is much more than the germ of the later treatise De jure belli. Its main principles, and the whole system of thought implied in the later, are anticipated in the earlier work. The arrangement even is the same. The chief difference between the two treatises is one which twenty years experience in affairs could not but bring the substitution of more cautious and guarded language, less dogmatic affirmation, more allowance for exceptions and deviations. The Jus pacis was an addition introduced first in the later work, an insertion which is the cause of not a little of the confused arrangement which has been found fault with in the De jure belli. The De jure praedae further demonstrates that Grotius was originally determined to this subject, not by any speculative intellectual interest, but by a special occasion presented by his professional engagements. He was retained by the Dutch East India Company as their advocate. One of their captains, Heemskirk, had captured a rich Portuguese galleon in the Straits of Malacca. The right of a private company to make prizes was hotly contested in Holland, and denied by the stricter religionists, especially the Mennonites, who considered all war unlawful. Grotius undertook to prove that Heemskirk's prize had been lawfully captured. In doing this he was led to investigate the grounds of the lawfulness of war in general. Such was the casual origin of a book which long enjoyed such celebrity that it used to be said, with some exaggeration indeed, that it had founded a new science. A short treatise which was printed in 1609, Grotius says without his permission, under the title of Mare liberum, is nothing more than a chapter -- the 12th -- of the De jure praedae. It was necessary to Grotius's defense of Heemskirk that he should show that the Portuguese pretence that Eastern waters were their private property was untenable. Grotius maintains that the ocean is free to all nations. The occasional character of this piece explains the fact that at the time of its appearance it made no sensation. It was not until many years afterwards that the jealousies between England and Holland gave importance to the novel doctrine broached in the tract by Grotius, a doctrine which John Selden set himself to refute in his Mare clausum (1632). Equally due to the circumstances of the time was his small contribution to constitutional history entitled De antiquitate reipublicae Batavae (1610). In this he vindicates, on grounds of right, prescriptive and natural, the revolt of the United Provinces against the sovereignty of Spain. Grotius, when he was only thirty, was made pensionary of the city of Rotterdam. In 1613 he formed one of a deputation to England, in an attempt to adjust those differences which gave rise afterwards to a naval struggle disastrous to Holland. He was received by James with every mark of distinction. He also cultivated the acquaintance of the Anglican ecciesiastics John Overall and L. Andrewes, and was much in the society of the celebrated scholar Isaac Casaubon, with whom he had been in correspondence by letter for many years. Though the mediating views in the great religious conflict between Catholic and Protestant, by which Grotius was afterwards known, had been arrived at by him by independent reflection, yet it could not but be that he would be confirmed in them by finding in England a developed school of thought of the same character already in existence. How highly Casaubon esteemed Grotius appears from a letter of his to Daniel Heinsius, dated London, 13th of April 1613. "I cannot say how happy I esteem myself in having seen so much of one so truly great as Grotius. A wonderful man! This I knew him to be before I had seen him; but the rare excellence of that divine genius no one can sufficiently feel who does not see his face, and hear him speak. Probity is stamped on his features; his conversation savours of true piety and profound learning. It is not only upon me that he has made this impression; all the pious and learned to whom he has been here introduced have felt the same towards him; the king especially so!" 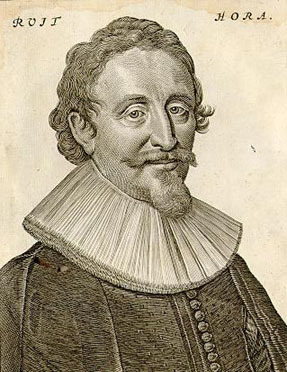 After Grotius's return from England the exasperation of theological parties in Holland rose to such a pitch that it became clear that an appeal to force would be made. Grotius sought to find some mean term in which the two hostile parties of Remonstrants and Anti-remonstrants, or as they were subsequently called Arminians and Gomarists, might agree. A form of edict drawn by Grotius was published by the states, recommending mutual toleration, and forbidding ministers in the pulpit from handling the disputed dogmas. To the orthodox Calvinists the word toleration was insupportable. They had the populace on their side. This fact determined the stadtholder, Maurice of Nassau, to support the orthodox party -- a party to which he inclined the more readily that Olden Barneveldt, the grand pensionary, the man whose uprightness and abilities he most dreaded, sided with the Remonstrants. In 1618 Prince Maurice set out on a sort of pacific campaign, disbanding the civic guards in the various cities of Guelders, Holland and Zeeland, and occupying the places with troops on whom he could rely. The states of Holland sent a commission, of which Grotius was chairman, to Utrecht, with the view of strengthening the hands of their friends, the Remonstrant party, in that city. Feeble plans were formed, but not carried into effect, for shutting the gates upon the stadtholder, who entered the city with troops on the night of the 26th of July 1618. There were conferences in which Grotius met Prince Maurice, and taught him that Olden Barneveldt was not the only man of capacity in the ranks of the Remonstrants whom he had to fear. On the early morning of the 31st of July the prince's coup d'�tat against the liberties of Utrecht and of Holland was carried out; the civic guard was disarmed -- Grotius and his colleagues saving themselves by a precipitate flight. But it was only a reprieve. The grand pensionary, Olden Barneveldt, the leader of the Remonstrant party, Grotius and Hoogerbeets were arrested, brought to trial, and condemned -- Olden Barneveldt to death, and Grotius to imprisonment for life and confiscation of his property. In June 1619 be was immured in the fortress of Louvestein near Gorcum. His confinement was rigorous, but after a time his wife obtained permission to share his captivity, on the condition that if she came out, she should not be suffered to return. Grotius had now before him, at thirty-six, no prospect but that of a lifelong captivity. He did not abandon himself to despair, but sought refuge in returning to the classical pursuits of his youth. Several of his translations (into Latin) from the Greek tragedians and other writers, made at this time, have been printed. "The Muses", he writes to Voss, "were now his consolation, and appeared more amiable than ever." The ingenuity of Madame Grotius at length devised a mode of escape. It had grown into a custom to send the books which he had done with in a chest along with his linen to be washed at Gorcum. After a time the warders began to let the chest pass without opening it. Madame Grotius, perceiving this, prevailed on her husband to allow himself to be shut up in it at the usual time. The two soldiers who carried the chest out complained that it was so heavy "there must be an Arminian in it." "There are indeed", said Madame Grotius, "Arminian books in it." The chest was carried to the house of a friend, where Grotius was released. He was then dressed like a mason with hod and trowel, and so conveyed over the frontier. His first place of refuge was Antwerp, from which he proceeded to Paris, where he arrived in April 1621. In October he was joined by his wife. There he was presented to the king, Louis XIII, and a pension of 3000 livres conferred upon him. French pensions were easiy granted, all the more so as they were never paid. Grotius was now reduced to great straits. He looked about for any opening through which he might earn a living. There was talk of something in Denmark; or he would settle in Spires, and practice in the court there. Some little relief he got through the intervention of �tienne d'Aligre, the chancellor, who procured a royal mandate which enabled Grotius to draw, not all, but a large part of his pension. In 1623 the president Henri de M�me lent him his ch�teau of Balagni near Senlis (dep. Oise), and there Grotius passed the spring and summer of that year. De Thou gave him facilities to borrow books from the superb library formed by his father. In these circumstances the De jure belli et pacis was composed. That a work of such immense reading, consisting in great part of quotation, should have been written in little more than a year was a source of astonishment to his biographers. The achievement would have been impossible, but for the fact that Grotius had with him the first draft of the work made in 1604. He had also got his brother William, when reading his classics, to mark down all the passages which touched upon law, public or private. In March 1625 the printing of the De jure belli, which had taken four months, was completed, and the edition despatched to the fair at Frankfurt. His own honorarium as author consisted of 200 copies, of which, however, he had to give away many to friends, to the king, the principal courtiers, the papal nuncio, etc. What remained he sold for his own profit at the price of a crown each, but the sale did not recoup him his outlay. But though his book brought him no profit it brought him reputation, so widely spread, and of such long endurance, as no other legal treatise has ever enjoyed. Grotius hoped that his fame would soften the hostility of his foes, and that his country would recall him to her service. Theological rancor, however, prevailed over all other sentiments, and, after fruitless attempts to reestablish himself in Holland, Grotius accepted service under Sweden, in the capacity of ambassador to France. He was not very successful in negotiating the treaty on behalf of the Protestant interest in Germany, Cardinal Richelieu having a special dislike to him. He never enjoyed the confidence of the court to which he was accredited, and frittered away his influence in disputes about precedence. In 1645 he demanded and obtained his recall. He was honorably received at Stockholm, but neither the climate nor the tone of the court suited him, and he asked permission to leave. He was driven by a storm on the coast near Danzig. He got as far as Rostock, where he found himself very ill. Stockman, a Scottish physician who was sent for, thought it was only weakness, and that rest would restore the patient. But Grotius sank rapidly, and died on the 29th of August 1645. Grotius combined a wide circle of general knowledge with a profound study of one branch of law. History, theology, jurisprudence, politics, classics, poetry -- all these fields he cultivated. His commentaries on the Scriptures were the first application on an extensive scale of the principle affirmed by Scaliger, that, namely, of interpretation by the rules of grammar without dogmatic assumptions. Grotius's philological skill however, was not sufficient to enable him to work up to this ideal. As in many other points Grotius inevitably recalls Erasmus, so he does in his attitude towards the great schism. Grotius was, however, animated by an ardent desire for peace and concord. He thought that a basis for reconciliation of Protestant and Catholic might be found in a common piety, combined with reticence upon discrepancies of doctrinal statement. His De veritate religionis Christianae (1627), a presentment of the evidences, is so written as to form a code of common Christianity irrespective of sect. The little treatise became widely popular, gaining rather than losing popularity in the 18th century. It became the classical manual of apologetics in Protestant colleges, and was translated for missionary purposes into Arabic (by Pococke, 1660), Persian, Chinese, etc. His Via et votum ad pacem ecclesiasticam (1642) was a detailed proposal of a scheme of accommodation. Like all men of moderate and mediating views, he was charged by both sides with vacillation. An Amsterdam minister, James Laurent, published his Grotius papizans (1642), and it was continually being announced from Paris that Grotius had "gone over." Henry Hallam, who has collected all the passages from Grotius's letters in which the prejudices and narrow tenets of the Reformed clergy are condemned, thought he had a "bias towards popery" (Lit, of Europe, ii. 312). The true interpretation of Grotius's mind appears to be an indifference to dogmatic propositions, produced by a profound sentiment of piety. He approached parties as a statesman approaches them, as facts which have to be dealt with, and governed, not suppressed in the interests of some one of their number. His editions and translations of the classics were either juvenile exercises prescribed by Scaliger, or "lusus poetici", the amusement of vacant hours. Grotius read the classics as a humanist, for the sake of their contents, not as a professional scholar. His Annals of the Low Countries was begun as an official duty while he held the appointment of historiographer, and was being continued and retouched by him to the last. It was not published until 1657, by his sons Peter and Cornelius. Grotius was a great jurist, and his De jure belli et pacis (Paris, 1625), though not the first attempt in modern times to ascertain the principles of jurisprudence, went far more fundamentally into the discussion than any one had done before him. The title of the work was so far misleading that the jus belli was a very small part of his comprehensive scheme. In his treatment of this narrower question he had the works of Alberico Gentili and Ayala before him, and has acknowledged his obligations to them. But it is in the larger questions to which he opened the way that the merit of Grotius consists. His was the first attempt to obtain a principle of right, and a basis for society and government, outside the church or the Bible. The distinction between religion on the one hand and law and morality on the other is not indeed clearly conceived by Grotius, but he wrestles with it in such a way as to make it easy for those who followed him to seize it. The law of nature is unalterable; God Himself cannot alter it any more than He can alter a mathematical axiom. This law has its source in the nature of man as a social being; it would be valid even were there no God, or if God did not interfere in the government of the world. These positions, though Grotius's religious temper did not allow him to rely unreservedly upon them, yet, even in the partial application they find in his book, entitle him to the honor of being held the founder of the modern science of the law of nature and nations. The De jure exerted little influence on the practice of belligerents, yet its publication was an epoch in the science.